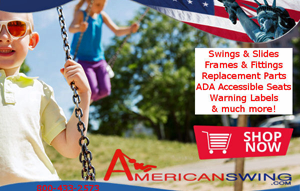 American Swing Products uses stainless steel and carbon steel in all of our commercial and residential playground equipment and swing sets, while others use only spring steel. If someone attempts to vandalize a spring steel seat its steel is exposed to the elements and will eventually rust and break, possibly causing an injury to a child who plays on this playground equipment. Our stainless steel swing sets do not have this problem, making them more durable and safe.